Showing posts from category JPR Special Issue. 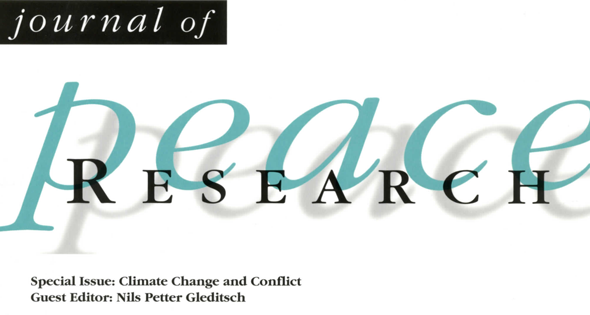 A January special issue of the Journal of Peace Research brings together a new collection of evidence on a subject that has been a mainstay of the environmental security agenda: the links between climate and conflict. Nils Petter Gleditsch, former long-time editor of the Journal of Peace Research, recently returned to guest edit a special issue on climate change and conflict (Jan. 2012). This article is based on his introduction to that issue. Violence is on the wane in human affairs, even if slowly and irregularly. Could climate change reverse this trend? Pundits and politicians have raised the specter of havoc caused by rising temperature, erratic patterns of rainfall, and rising sea levels. In this way, so the story goes, climate change will produce famine and mass migration that threatens political stability and provokes violence. However, to date there is little evidence that the meteorological or agricultural conditions associated with climate change are actually a major source of violence.